As a kind of feed processing equipment, the wet type fish feed extruder can make fish pellets from corn, bean pulp, corp stalk, grass, rice hull and so on. 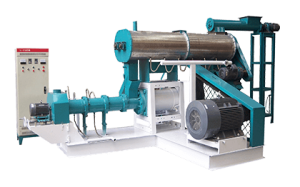 The wet type fish feed extruder machine is widely used in making both floating fish feed and sinking feed pellets for aquaculture farms, feed mills, livestock farms and poultry farms. 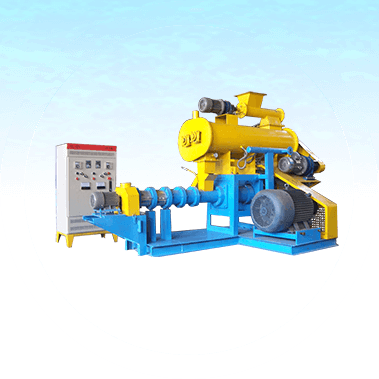 Different from the dry type floating fish feed pellet mill, the wet type is equipped with a boiler which can continuously steam the materials to make pellets. It is a crucial machine for making high-quality fish pellets and pet food. 1.This kind of fish feed extruder machine owns simple structure, wide application, and low noise. 2.It can improve the quality and floating time of the fish feed pellets. 3.Salmonellosis and bacterial infections of the raw materials will be eliminated after being processed by the high temperature and pressure. 4.We offer different die molds to meet the various needs of the diameters of feed pellets. 5.The high-quality steel is adopted to guarantee the long service life of the extruder. 6.The jacketed construction of the extruder is adopted to control the extruding temperature by adding the materials with hot steam or cooling water. 7.The fish feed pellets are more economical than the compound powder feed. 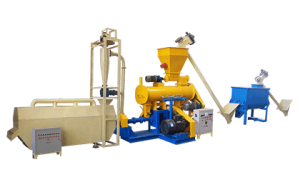 Fish feed making machine can be divided into dry type and wet type fish feed extruder according to the moisture of the raw materials. Heating the materials by the frictional force, this floating fish feed extruder machine squeezes raw materials out of the holes of the mold under the action of screw extruder. The pressure and temperature of the pellets sharply decreases when coming out of the machine, and the moisture evaporates. Then materials are puffed and become pellets with porous structure. During the process, the moisture ranges from 15 to 20 percent. The working principle of wet type is similar to dry type. But the former needs to add water or steam into the machine to increase the moisture to 20 percent, or more than 30 percent during the process. It increases the temperature of the materials by steaming. 1.Feed pellets are germfree, well cooked, and easy to digest for the fishes. 2.The protein of the materials is denaturalized after being processed by the floating fish feed extruder. It rises the digestibility and tastiness of the feed. 3.The pellets are light, so that they can float on the surface of water. It reduces waste of feed and pollution of the water. 4.Feed pellets contains low moisture, which is convenient for storage and transportation. Kindly send your offer for floating fish feed complete plant.having capacity of 1000kg/hr. On 3 mm die plate. 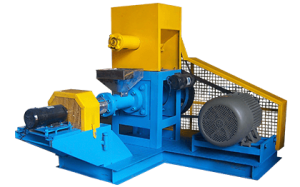 ( The extruder should be wet type only) cnf Chennai port in India. Also total power (kW) and steam required for the same.